In my last post, I wrote about a Dr. Seuss Party that was just for three visiting kindergarten classes, but I wanted to offer something for the public. Looking at my calendar for March, all I had was opening on the last Saturday of the month, which was technically a little far from Dr. Seuss’ birthday on March 2. I thought about not doing one, but while I was helping a co-worker in another branch come up with ideas for her public event, I remembered Horton Hatches the Egg. Not only is it one of my favorite Dr. Seuss books, featuring my favorite kind of animal, and a story that’s too cute to be believed…but it’s also a really great option for a program near Easter that you don’t want to be obviously about Easter. It has an egg, but it’s otherwise totally inconspicuous. And then I would either read the whole book, or ad lib it using the pictures depending on the age of the crowd. At the start of the event, I only had one little girl who was around five, but she was very hyper and clearly was only at the event because her grandmother didn’t know what else to do with her. I showed her the book and described what it was about, but then I asked if she wanted to read it together or do the crafts. (When you only have a crowd of one, I find it’s awkward to try to read a book the child’s not into.) Unsurprisingly, she opted just for the games and crafts, so I obliged. I was thinking I’d rather give her a happy experience at the library with things she likes than push my own agenda. Over the next hour or so, we had a couple people join us late and other families who were just passing through stopped in to play together for awhile. All in all, I had 17 people stop to do a game or craft. I told them about the book and one family took it home with them to read together. Others liked talking about elephants while doing the activities. So here are the stations. 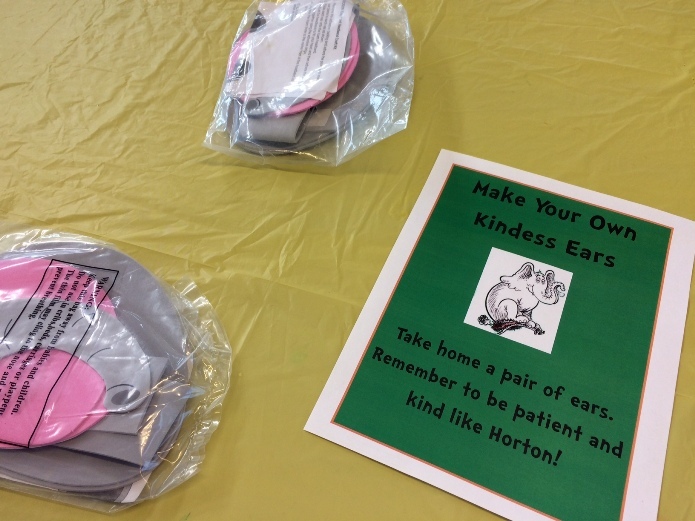 Most families started with our station for making wearable elephant ears. This a craft I purchased from Oriental Trading that makes an adorable, adjustable head band for kiddos, complete with a trunk. It was a big crowd pleaser. As you can see, I called them “kindness ears” and made sure everyone knew that they had to be extra nice and patient when wearing them. 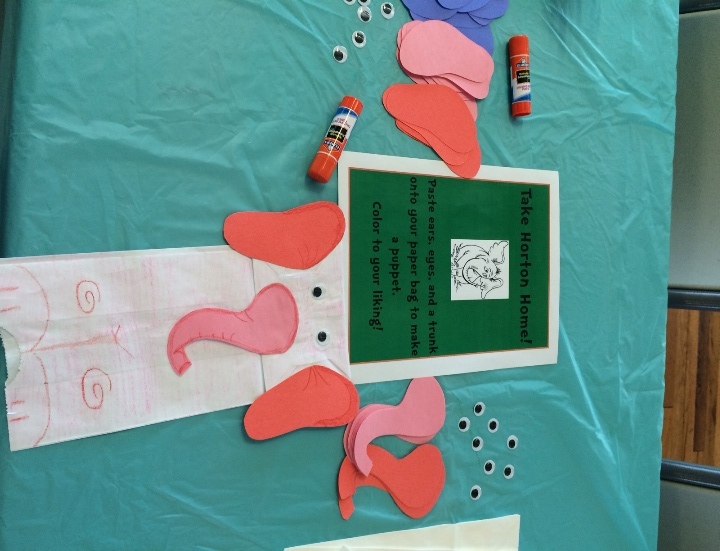 The next was a station for making a paper bag elephant. I included this activity just for a family with a special needs son. His mom told me once that he loves to make puppets, so when she told me he was coming, I wanted to make sure there was something he’d like doing. This was a memory game. 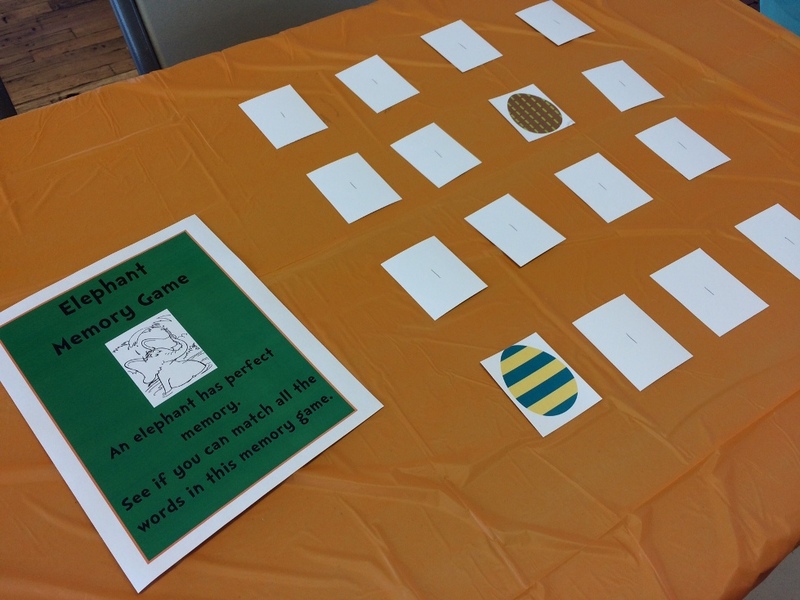 Since elephants have a great memory, I challenged kids to match the eggs. I found this free printable game on the Mr. Printables website. I had two decks on the table and families generally split into pairs to play with each one. Finally, there was this station for an egg and spoon race. I had a straight line taped on the floor for them to race alone or in pairs, but I also had an obstacle course of folding chairs for the more advanced kids. 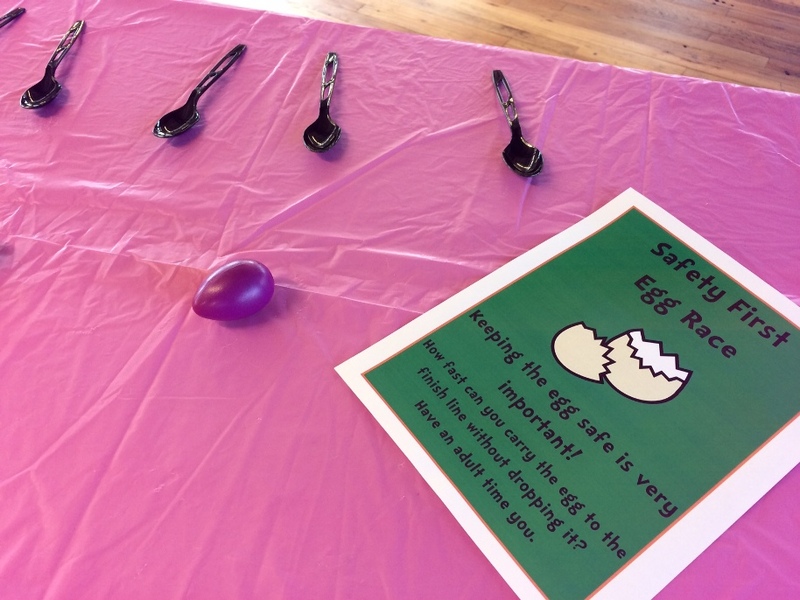 I used shaker eggs for this activity, so there was no possibility of a mess. This was a really fun and super simple activity that I was able to whip up entirely within a few hours. If you’re looking for an easy Dr. Seuss party or a sneaky Easter-ish program, this just might work for you.